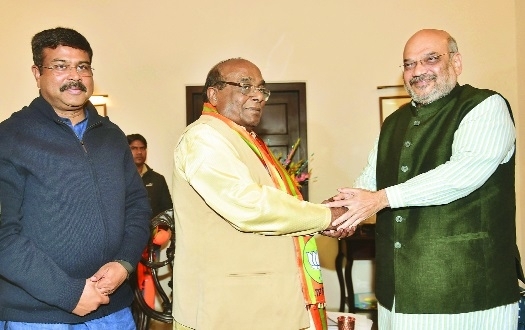 DAMODAR Rout, an MLA in the Odisha Assembly and former Minister in the BJD Government, on Thursday joined the BJP in presence of senior party leaders. Chief Minister Naveen Patnaik had recently removed him from his Cabinet and later expelled him from the BJD. Rout joined the BJP in the presence of Union Minister Dharmendra Pradhan and party General Secretary and in-charge of Odisha Arun Singh. Rout said that he would work for the ouster of the Patnaik Government in the Assembly elections scheduled to be held along with the Lok Sabha polls. Pradhan said that his joining the BJP will strengthen the party in the State. Rout had been a Minister in all the 4 Governments headed by Patnaik and was seen to be close to him before falling out with the BJD President. He is the second BJD bigwig to switch over to BJP.